Real or imagined, San Juan Capistrano's ghost stories add a special flavor to its folklore. They have provided mystery and suspense for two centuries and whether you believe in them or not, they are a source of continuing entertainment. The "white lady," who materializes in fog and likes to call attention to herself, has been sighted on Los Rios Street, the Capistrano Villas, Las Brisas, and in the foothills behind Del Obispo. She's a playful ghost, dressed in a long white dress, who cavorts and teases, but never lets anyone catch up to her. La llorona, "the weeping one," is heard along the banks of Trabuco Creek on moonless nights when the breeze is whispering through the trees. A transplanted ghost popular in Mexico and the American Southwest, her crying is endless as she mourns the children she drowned. Belford Terrace has the ghost of Denise Duprez, a small child killed in the fire that destroyed the mansion for which the tract is named, who cries for the adulthood she never reached. Along San Juan Creek, ghostly flute music is sometimes heard, played on a reed flute by the ghost of an Indian who lived there long ago. The Forster Mansion on Ortega Highway is said to have a cigar-smoking ghost seen sometimes at the foot of the interior stairs. Los Rios Street, one of the oldest residential streets in California still in existence, seems to have the most spirits. It has the white lady, who appears near the giant pepper tree north of the Rios Adobe, tossing her mane of long, black hair, beckoning you to follow. It also has the Pryor House, now the O'Neill Museum, where the ghost of Albert Pryor is sometimes seen wearing a gray sweater, rocking on the front porch. The Rios Adobe has ghostly footsteps, sometimes heard by members of the family when doors were locked and everyone was asleep. The Ramos House, now a restaurant, was once known for its "cold room" and poltergeist activity. Chanting and strange lights were sometimes reported from the Montanez Adobe, across the street. Even the Mission has its ghosts. There is a faceless monk who roams the back corridors at night, his sandals echoing through the stillness as he hurries away to melt into the shadows. There is a headless soldier, who stands guard near the garrison building, and the sound of bells that ring mysteriously in the night. One of the most poignant stories is about the ghost of Magdalena, a young girl who lost her life in the earthquake of 1812. She was a penitent that morning, holding a candle as she walked in front of her peers in the Great Stone Church. She must have heard the roar and felt the walls shake as the roof domes came crashing down on the worshippers. On nights with a fingernail moon, only her face is seen, illuminated by a candle in the highest windows of the ruins of the Church. Those who study unexplainable activity characterize a ghost as an image from the past, and a spirit as an energy force that is still around and is active, either attaching itself to its place of death or a place where it was happy. Whether they are ghosts or spirits, San Juan Capistrano has the highest number of sightings per capita than any other place in Orange County. Most of the spirits are playful, or keep to themselves. Some can be traced to specific events - others cannot. No matter where you live in the Capistrano Valley, there is bound to be a ghost to keep you company this Halloween. 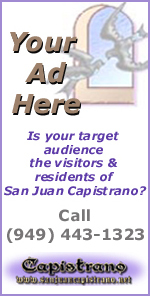 Ghosts are as much a part of San Juan as the swallows---only they don't leave.